The day started as usual, I got up, changed the baby (that wasn’t fun, if you know what I mean), got myself ready, went to the kitchen, prepared the breakfast for us two, put some chill music on…I enjoyed eating my cereal and feeding my baby, who, by the way, couldn’t keep calm for a second. Instead, she was “talking” and spitting food all over me, but never mind I’m used to it by now:)… so everything was as usual when all of the sudden my friend stormed in the house and said, “I need a cake in 2 hours….” Honestly, I didn’t even hear the explanation why she needed it, it was a long one:). I only heard “cake”, “two hours.” Of course, I wanted to help her. I’m a good friend. So I was thinking about what to make in that short period of time and I ended up mixing 2 recipes in one and voila :D! It turned out PERFECT! 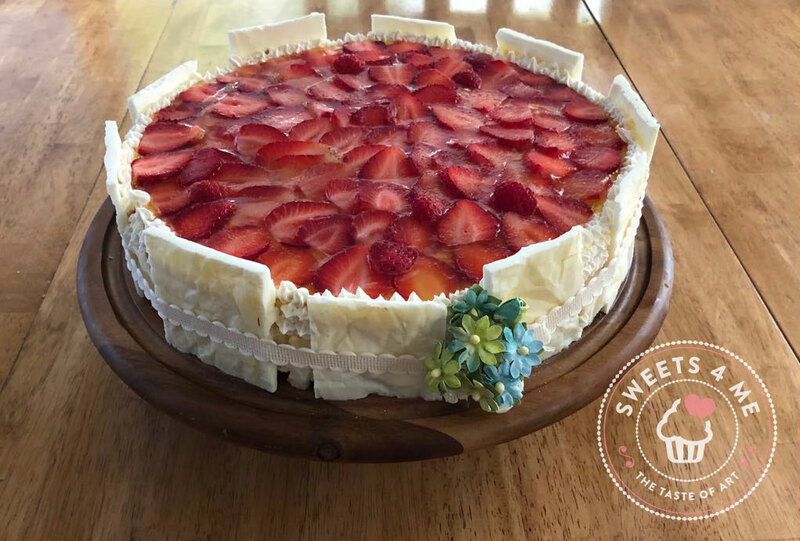 This is a strawberry cake, with 3 thin layers, frosted with a combination of whipping and sour cream… so refreshing. I decorated it by melting white chocolate on a piece of crumbled parchment paper and straightened the parchment paper out until it had some wrinkles in it. I poured the white chocolate on the wrinkled paper, and then I waited ‘til it hardened and took the chocolate off. Mix together egg whites, sugar, sour cream, and oil. In a separate bowl, mix flour, baking powder and almonds. Add the dry ingredients into the wet ones, mix just until combined. Bake for 20 minutes. Check with the toothpick if the cake is done. If it comes out with a few moist crumbs, it’s done. Move the cake to the cooling rack and let it cool completely. Beat heavy whipping cream and sugar. In the middle of mixing, melt the gelatin on the low heat and pour it into the heavy whipping cream, continue beating until firm. Combine with sour cream by hand. Mix slowly. In a small glass, mix together the juice and the cornstarch. In a small pan combine raspberries, strawberries, vanilla and sugar. Heat until the point of boiling. Add the juice/cornstarch mixture. Cook until firm, mixing constantly. About 3 minutes.